LPW Technology Ltd has officially opened its purpose built AM metal powder manufacturing facility. 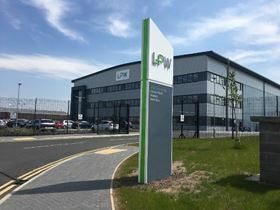 LPW Technology Ltd, which makes metal powders for the metal 3D printing industry, has officially opened its purpose built, AM metal powder manufacturing facility. The 90,000 ft2 building sits on a seven-acre site in Widnes near Liverpool, UK. The factory houses a variety of powder production equipment to melt feedstock at approximately 1700°C. The molten metal is then converted into fine grade metal powder used to 3D print parts for critical applications in aerospace, automotive and biomedical industries. It has separate cells, protected with air-locks and operating as clean rooms, to enable clear segregation of materials. ‘It is very uplifting to see LPW, whom the borough has supported in its development of this site, deliver for UK manufacturing,’ said borough councillor Rob Polhill. LPW Technology has held its first Open House Reception for AM industry professionals, to explore its new facility in the US. LPW Technology will be showcasing its new range of ‘clean’ powders for AM at Formnext 2017.